Pure Spa Directs has a large variety of towels, but Salon & Spa buys prefer the ORIGINAL BleachSafe® towels for their quality, longevity and beauty. That's because all BleachSafe towels are 100% premium cotton, long lasting, fast drying, softer & more absorbent than any other fade resistant towels, AND they are available in 13 vibrant colors. 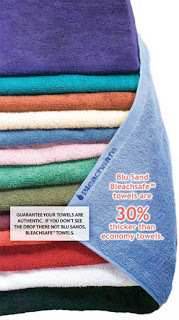 BleachSafe® color towels are resistant to all bleaches and peroxides. Stains can be removed by laundering with hot water or chlorine bleach without fading or damaging the fabric. TOUGH STAINS, GERMS AND BACTERIA COME OUT, WHILE THE COLOR STAYS IN! The difference is in their patent pending process which keeps BleachSafe towels looking fresher-- longer. It's NOT a coating, but in the actual fabric & will last for the life of the towel. The best salons in the country choose Blu Sand BleachSafe towels. Upgrading your towels helps to upgrade your image. We strongly recommend Beach Safe!